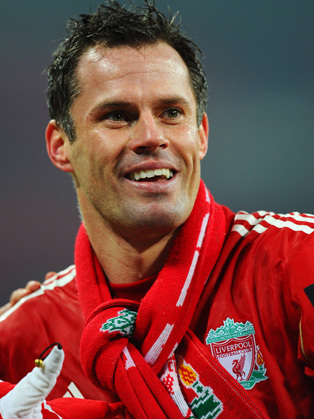 A one-club man, Jamie Carragher was Liverpool’s vice-captain for 10 years, and is the club’s second-longest ever serving player, making his 737th appearance for Liverpool in all competitions on 19 May 2013. Carragher also holds the record for the most appearances in European competition for Liverpool with 150. Carragher grew up as an Everton football fan before deciding to play for Liverpool, starting his footballing career at the Liverpool Academy, making his professional debut in the 1996 -1997 season and becoming a first team regular the following season. Having initially played as a full-back, in 2004 saw Carragher move to become a centre-back, where he found his best form. Internationally, Carragher held the national record for most caps at under-21 level and earned his senior debut in 1999. He represented England at the 2004 European Championship and the 2006 FIFA World Cup, before announcing his retirement from international football in 2007. He did, however, temporarily come out of retirement in order to represent England at the 2010 FIFA World Cup, before retiring again with 38 senior England caps. Jamie’s work with the 23 Foundation keeps him busy attending events, promoting the charity and doing whatever he needs to help develop it further. Jamie is also a popular figure on our TV screens, working as a pundit for Sky Sports. Jamie also works as a occasional sports columnist for the Daily Mail sharing his views on what’s happening in the world of football.